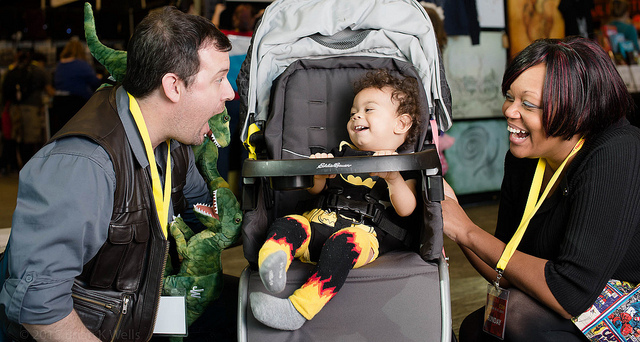 The beautiful thing about bringing kids to GeekGirlCon, is that it is very family-friendly. From panels about parenting and kid creators (which I’ll be moderating!) to our kid-focused DIY Science Zone and kid-friendly costume contest, GeekGirlCon has gone out of their way to make sure that kids are not just allowed, but welcomed at the convention. That being said, it can be a challenge to bring kids to any convention. After many years of trial and error, I’m here to share the tricks and tips that have worked for the Parenting Geekly family. Written by Guest blogger Adrienne Roerich. Summertime is a time for vacations and relaxing, at least for the kids. At my house, it means more time to play games. A couple years ago, I posted about the games my kids were playing, but this year, my husband and I are also playing some new games. All ages welcome at GeekGirlCon ‘14! And what is there to do for these geeks-in-training? The DIY Science Zone has tons of fun in store for kids of all ages! Last year’s science zone was a hit. This year they have a ton of great projects planned. The gaming floor is ever-popular with kids. 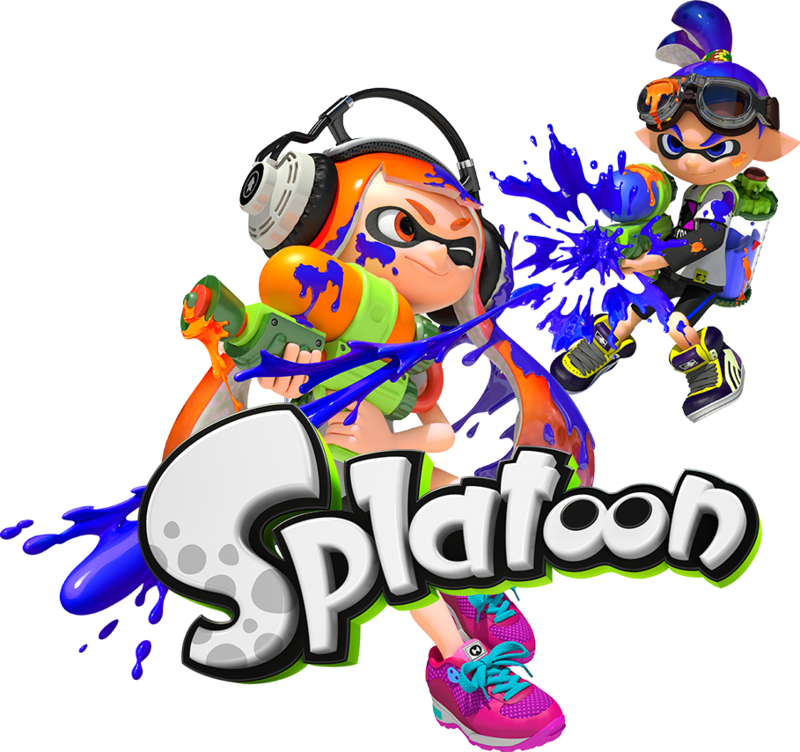 With a wide variety of games and game types present, they’ll find something to enjoy. In addition to all the exciting games to try out, there’s a Paint ‘n’ Take miniatures painting session on Saturday morning from 10 am – noon. “Imaginary Worlds for Kids” happens twice during the weekend! Saturday at 11 and Sunday at 3pm, you can bring your 10 and under to an interactive storytime for families, including a lively author reading, participatory creative and singing games, and a lot of faerie mischief. A seasoned and award‐winning spoken word artist and educator, Danika Dinsmore has performed at hundreds of events, from the Bumbershoot Arts Festival in Seattle, Washington, to the FaerieWorlds International Festival outside Eugene, Oregon. Imaginary Worlds will keep your kids buzzing with inspiration! Bring your teen to learn all about representation in the books they (and you!) may be reading at “Diversity in Young Adult Fiction.” Representation is vital for people of all races, sexualities, gender identities, and abilities. According to Malinda Lo’s 2013 Diversity in YA website, only 15% of NYT Bestselling YA Books had people of color as main characters, and only 12% of books had LGBTQ main characters. This panel will examine the market today, what readers want versus the disconnect with publishers’ diversity, and what we can do to improve the number of diverse books for teens. We have parent-specific programming, too! Are you a new mom or a mom-to-be? “Geek Girl Transformation to Geek Mom” is all for you! It goes without saying that everything changes when a baby arrives in your world. But for geek girls turned geek moms, there are some unique changes and challenges in store. Don’t worry—that’s what we’re here for! Join a panel full of geeky moms who know what it’s like to have your life, career, and identity turned joyfully upside down when you add kids to the crazy mix of your life. Comics, games, and films tend to go the “less is more” route when it comes to representation. Often we only see one character of a racial, gender, or sexual minority. Even worse, some people aren’t represented in media at all. Kids grow up asking, “Where are the characters like me?” At “Why Isn’t Bilbo a Girl? Talking to Kids About Media Representation” you can have a thoughtful discussion regarding how we address this issue with kids—with an emphasis on constructive, positive, and educational answers for the kids who ask. 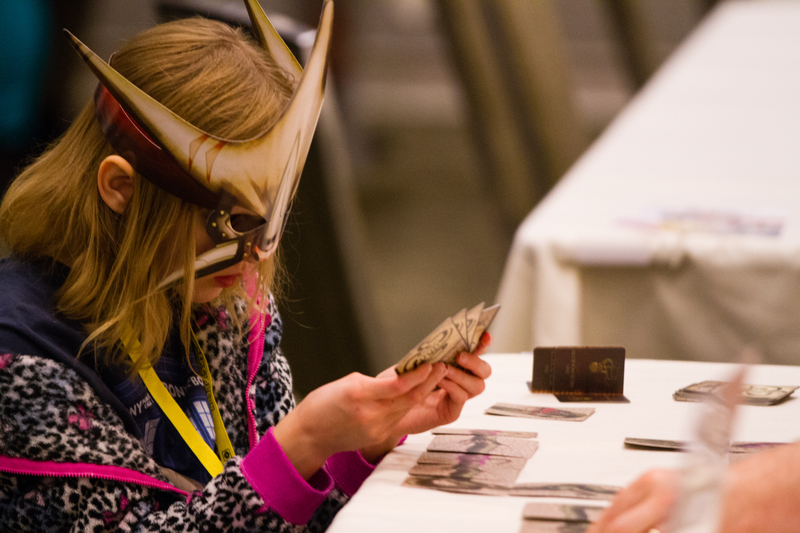 Lastly, for the parents of cosplayers, or cosplayers themselves who want tips on talking to their family, come to “Cosplay, Parenting, and the Word ‘Appropriate’.” Come discuss cosplay from the perspective of children, teens, and adults who cosplay as individuals and as families. 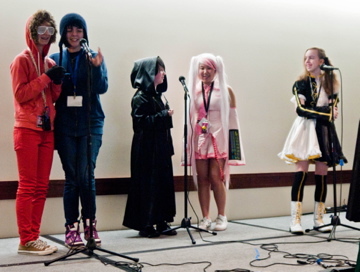 This panel of parents and kids who cosplay will cover a range of topics: How to present cosplay to your parents? 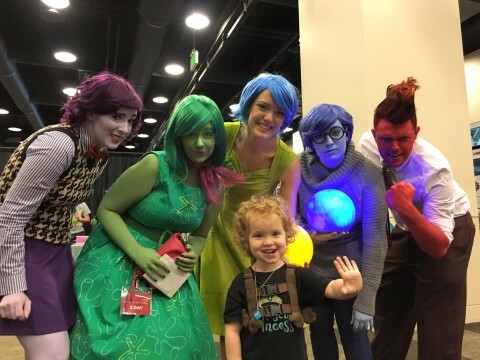 How to present cosplay to your kids (and not embarrass them)? How does a parent encourage their teen to express themselves, be body positive, and consider modesty? How do you discuss appropriation vs. appreciation? Deep topics, some advice, lots of discussion! Most of the panel programming is all ages, so please bring your family to enjoy your favorite topic. And be sure to get your passes now! When the DVD/Blue-Ray release of Frozen occurred, my social media timelines filled with parents posting that they were watching the movie that night with their kids. When it was premiered in theaters on Thanksgiving, I heard mostly positive reviews from so many sources, parents and non-parents alike, I thought I’d see it if I could. So, within a weekend or so of the DVD release, we had a family movie night and watched the Blue-Ray of Frozen. Mostly my fourteen-year-old daughter, who was the only one of all her friends to not have seen it yet, and I were the ones interested in watching. However, my husband and thirteen-year-old son were happy to do family movie night with a Disney movie. I am someone who really dislikes spoilers. If I don’t think I’m ever going to see or read or consume a thing, I don’t worry about them. Initially, Frozen was one of those things. However, what I had read caused me to want to see Frozen, and I had some spoilers. While I normally try to write spoiler-free reviews, I’m going to assume that since the movie was in theaters Thanksgiving 2013 and released for home video March 18, 2014, if you are interested in the movie, you’ve seen it already. Loosely based on Hans Christian Andersen’s The Snow Queen, the story focuses on a pair of sisters. I felt like it was really the younger sister’s story more than the Snow Queen sister, but it was definitely their story together. The opening scenes introduce us to the culture and Kristoff and Sven, which is sort of too bad because it had me wondering who this character (Kristoff) was in the grand scheme of things pretty far into the movie. The initial scene that sets the premise for the story of Anna getting Elsa to play with her Snow Queen powers, leading to the accident that requires the separation of two girls previously inseparable is very touching. It was very hard to watch Anna try so hard to get her sister back. However, I don’t think the isolation of Elsa and how she felt was as well displayed. Of course, the parents die. The parents always die in Disney movies. (Every time parents die in film I always recall seeing The Lion King in theaters and a child a row or so away screaming “Not the Daddy! Not the Daddy!”) As a kid, I actually didn’t mind that so much, but as a parent it’s a little rougher. The love song portion with Anna and Hans confused me. It seemed ill-fitting for the message I had received from sources, but I held on for the ride. I’d heard the Prince was a terrible person, but like Anna, I kind of bought it during the love song. Spoiler: don’t buy it. It’s an interesting nod to the oddity of all previous Disney movies where during one song, the girl and guy fall in love. One of our film watchers did not really get into the movie until Kristoff and Sven came back on the scene with some real lines. This was because he could identify with a guy having a friend that didn’t talk, but he used a funny voice for to make up lines. For my family, Kristoff was a good source of humor, along with Olaf. Anna also had her moments. The adults in the family thought her “trust fall” line was well done. Likely a little out of character if I must analyze, since it’s doubtful this isolated princess ever did trust fall exercises. I’ll admit, I thought Olaf melting to help Anna stay warm might do the trick to save her. I’m very happy with Anna saving herself by sacrificing herself for her sister. I’ll also admit that I didn’t get why everyone loved “Let It Go” so much until seeing it sung in the movie with what it truly meant. Now I get it. I’m not thrilled or even okay with the diversity of the cast (either as drawn or as voiced.) I’ll give Disney their small steps of at least getting some women-power in there, but they have huge racism issues to overcome since their early days and continuing through the current day. There are also body size issues in this movie. Disney draws all the “good” guys in culturally idealized body shapes for both women and men. The only non-idealized bodies are by those who are plotting bad things (or are made of snow). 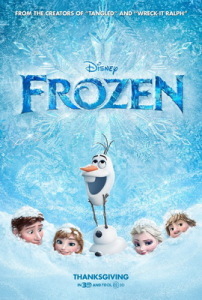 I’ve encountered several people who also watched Frozen after the DVD release for the first time and they were disappointed or at least not wowed the way one would expect based on the theatrical release noise. This is why: it was over-hyped. For those who went to a theatrical release expecting a typical Disney movie and got something that focused on two women as central characters and self-saving, this is a huge step forward and was amazing and cool. For those of us who listened to months of how awesome this is, it doesn’t live up. I spent the entire movie up until the actual sacrifice/savior scene wondering when the movie was going to live up to the hype. That’s extremely late in a movie for that. And then it wasn’t, oh wow! It was, oh, that’s why people liked this so much. Yeah, it shouldn’t be that intellectual. Overall, this is a good movie. If you have a child with death-fears, maybe not this movie or any Disney movie where the parents die on-screen. But I think this is suitable for all ages and all genders (although some are not represented). 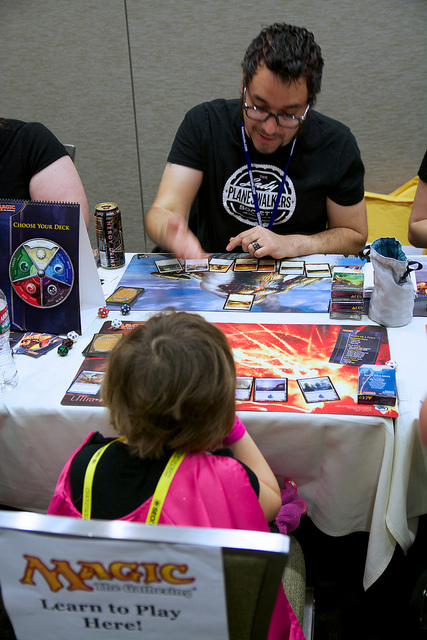 One of the most family-friendly aspects of GeekGirlCon is the gaming floor. 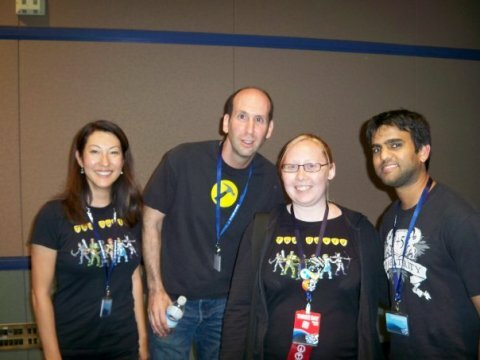 At GeekGirlCon ‘11, we spent hours at the Steve Jackson Games table playing Munchkin and learning new versions of the game. Steve Jackson games appeared at GeekGirlCon ‘12 and returns to GeekGirlCon ‘13. They produce over a hundred varieties of board, card, and dice games with geeky twists. Look for Bhaloidam Adventure, a game designed to help you tell stories; Cheapass Games, a company that has been making affordable games for almost two decades; Green Ronin Publishing; Paizo, who will be running one-hour demos of The Pathfinder Roleplaying Game; Story Games, presenting several of their peer-to-peer tabletop RPGs; Valor, a game for those at least in their teens and older meant to increase performance in both combat and challenge for in-game characters; and Wizards of the Coast, to give your dungeon crawling skills a workout. Game designer Keith Baker will be talking about games and running demos all weekend. So check out The Doom That Came To Atlantic City and get an early peek at his latest game, Phoenix: Nine Deaths. Kenny Owens will guide you through playing “staple” board games, such as Settlers of Catan, and helping you figure out other games you’ve always wanted to learn. Want to have your own figurine for game play? You can attend the workshop to “Learn to Paint Miniatures and Take One Home!” Privateer Press is sponsoring this workshop in room LL1 from 10:00 a.m. – 2:00 p.m. on Saturday. Stop on by to paint your own miniature to add as a part of your own tabletop and board game play, and you’ll have a fantastic GeekGirlCon ‘13 souvenir! Other workshops include LARPing and designing a tabletop RPG in an hour! Don’t know how to LARP? First, attend the session to learn the basics of live action role-playing by LARP Master Shoshana Kessock, then spend a couple hours putting your new skills to use. Want to expand your RPG library? Andy Munich is there to help new players and seasoned campaigners learn and play a variety of games. My family has also enjoyed the Game Lending Library. GeekGirlCon ‘13 has loads of board and card games for you to try. We found a bunch of new games we later added to our board game collection by playing some of these generously loaned games. Don’t miss the EA/PopCap Games console game room, generously repeating their hosting the console room during GeekGirlCon ‘13. You and your family can enjoy EA and Popcap games on XBOX 360 and iPads. This year, a raffle benefiting a local Seattle charity with a mission to encourage girls to pursue STEM education and careers can benefit you with some marvelous prizes. Consult your Strategy Guide to learn more. Not to mention all the panels on game-related topics, such as “Women in Gaming, Female Characters in Game Design,” “Let’s Make a Game Right Now,” “20 years of MYST,” “You Should Make Games!,” “Yuri Anime/Manga Battle!,” “Writing for Role-Playing Games,” “How to Build Inclusive & Welcoming Gaming Communities,” “Gaming and Comics Panel,” “The Family Who Games Together,” and “#1REASONWHY,” among others. Please note that not all the panels listed here are necessarily family-friendly. Finally, don’t miss stopping by the DIY Science Zone! Other programming exists for your kids. Your teens may want to learn about strong female characters in young adult literature, or your cosplaying kid may want to get an intro to costume craft and cosplay, or your comic-enthusiast child may want to learn about keeping girls real in comics, or your Star Wars fan may want to learn about all the opportunities for all the ways to enjoy their favorite galaxy far, far away. Want to connect with other parents—whether you, your kids, or all of you are geeks? We’ve got programming for you, too. Attend a workshop called “You and Your Connected Kid” about safety, privacy, identity, and plagiarism, while being media-positive and encouraging use of social media. “The Family Who Games Together” is a panel to talk with you about being a multi-generational gaming family. 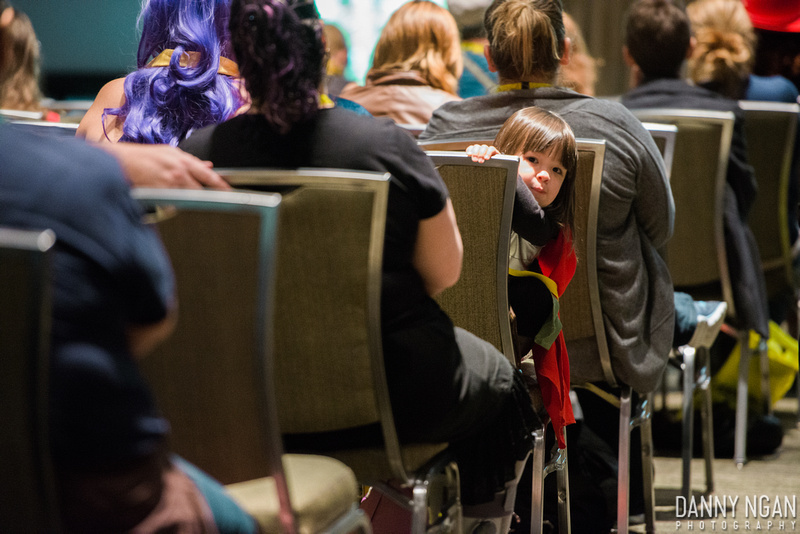 Maybe your kids aren’t interested in panels. The Exhibitor Hall and Artist Alley offer fun and engagement. And your kids will not want to miss all the cosplay. In fact, the Zelda family will attest to the fun of cosplaying together! And your kids will not want to miss all the cosplay. At GeekGirlCon ’12, the Zelda Family, the Darth Vader Princess (Darth Makenna), the little Wonder Woman, the robot, and every other outfit left us “ooo”-ing and “aww”-ing. These young children are truly our future, so thank you for encouraging them to ask questions, think critically, and believe in themselves. So come on out to GeekGirlCon ‘13 for your gaming interests, a safe place for your family, and all your geeky indulgences! Children under 5 are free and ages 6-10 are only $5! Get your passes now, pick them up Friday afternoon (so your children need not wait in line), and bring your family to a weekend of geekery they won’t want to miss! 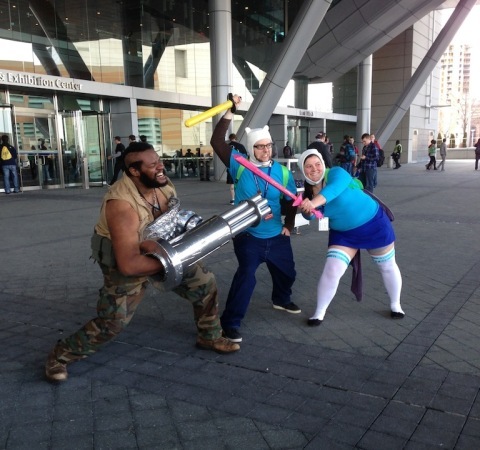 Ask GeekGirlCon: What is your favorite part about attending cons? 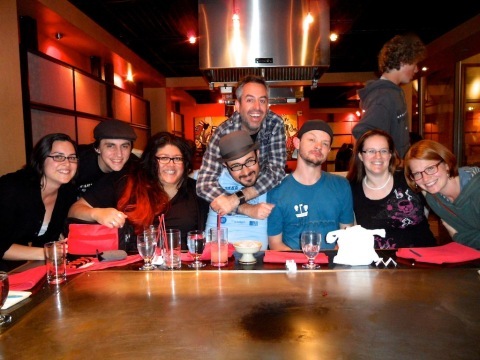 With GeekGirlCon ‘13 coming up, it seemed appropriate to get the staff of GeekGirlCon to share what they love about attending cons. 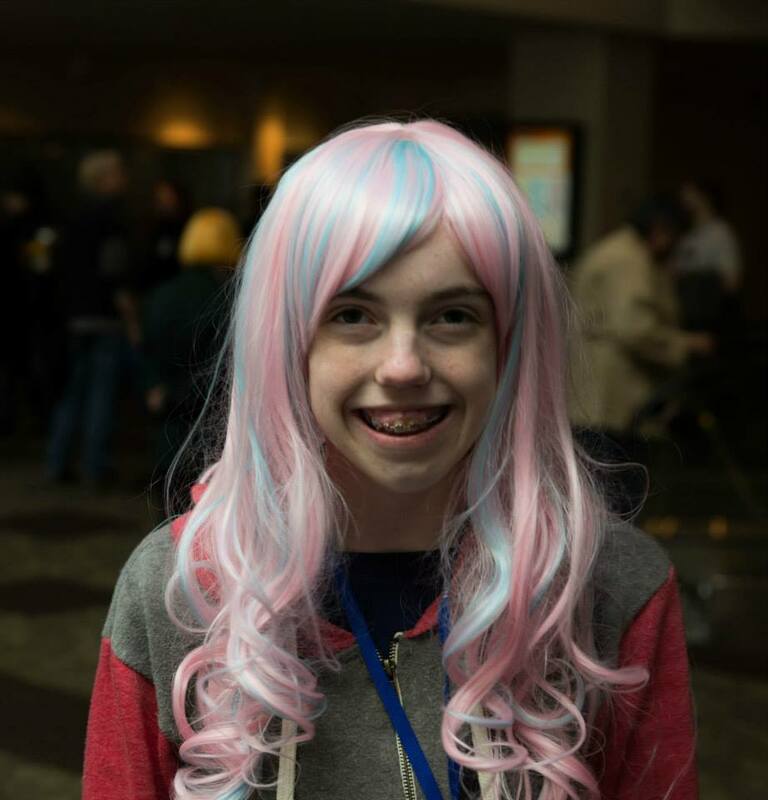 Some of the staff are long-time convention attendees with a dozen and more cons under their belt, while others are going to attend their first con this year—GeekGirlCon ‘13. It is clearly evident GeekGirlCon President of the Board and Twitter Administrator Kristine Hassell adores cons. 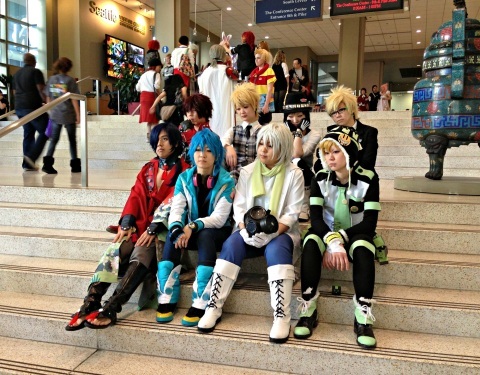 “It was hard to single out the one thing I love about attending conventions. I love the lack of sleep, the bottles of Oi Ocha that become my fuel, and the excitement over panels, and what creative cosplay will cross my path…and I even love the soreness that comes with traversing all over the convention floor. Okay… maybe not that far, but I got carried away. If hard-pressed to name a single thing, it’s that feeling of community that spontaneously happens when you’re surrounded by your peer group. I love meeting new people who will get my jokes and references. Seeing those people again the next time that particular convention happens. Familiar faces become acquaintances who become friends that turn into family. What is it that you love about attending cons? Come to GeekGirlCon ‘13 to let the staff know exactly what your favorite aspect is! GeekGirlCon ’13: What’s the Best Way To Learn Science? Why, hands-on, of course! GeekGirlCon ‘13 has some science for you. Interested in a career in STEM or computer science? We’ve got you covered. We have a number of workshops and panels on topics such as astronomy, biology, chemistry, neurology, and paleontology, presented by scientists and science communicators. Alice Enevoldsen, also known as Alice’s AstroInfo, wants to share “inspiration and excitement about science for everyone” with her panel, “Making Science Fun.” You can expect exciting demonstrations of various techniques and useful tips for engaging in science exploration with not only the children in your life, but everyone, really! Another star-studier comes our way—the Noisy Astronomer, Nicole Gugliucci. Build a solar system, an active galactic nucleus, a supermassive black hole, craters of the moon, and more with fun items right from the grocery store! “I love doing hands-on astronomy activities because it gives kids (and adults!) a feel for the concepts and a way to interact with ideas and objects that are usually so far beyond our grasp,” comments Nicole. Returning exhibitor Amy Roth Davis of SurlyRamics assists. Still have lingering questions? More astronomers are expected to attend and you can ask them all the questions you have about life, the universe and everything in between. Photo by cizake (Flickr) and used under a Creative Commons License. Other workshops cover additional mind-expanding topics. 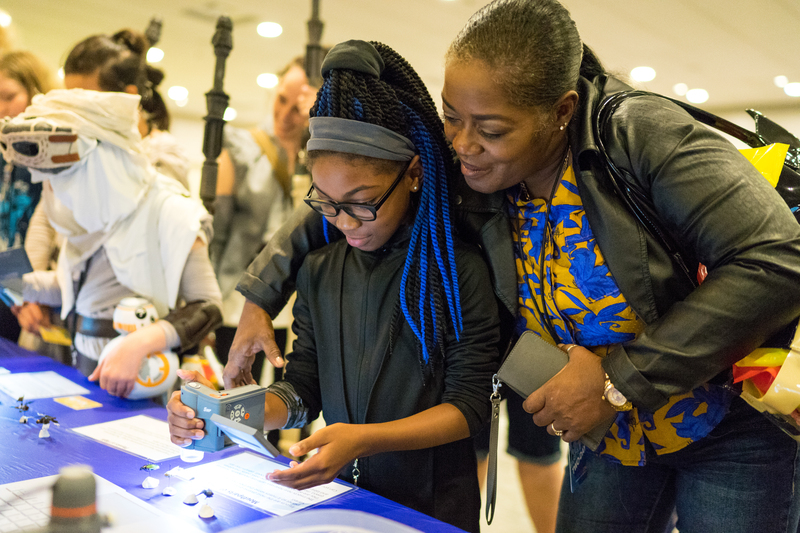 Post-doctoral research associate in the Department of Chemistry at Doane College and the Center of Nanohybrid Functional Materials at University of Nebraska, as well as GeekGirlCon media administrator, Raychelle Burks brings together scientists to present the DIY Science Zone. Bring your friends and your kids for hands-on experiments suitable for all ages. Pop in for a five-minute session or spend the whole day! All experiments will feature how-to guides and use common household and easily available supplies, so you can take the ideas home with you. 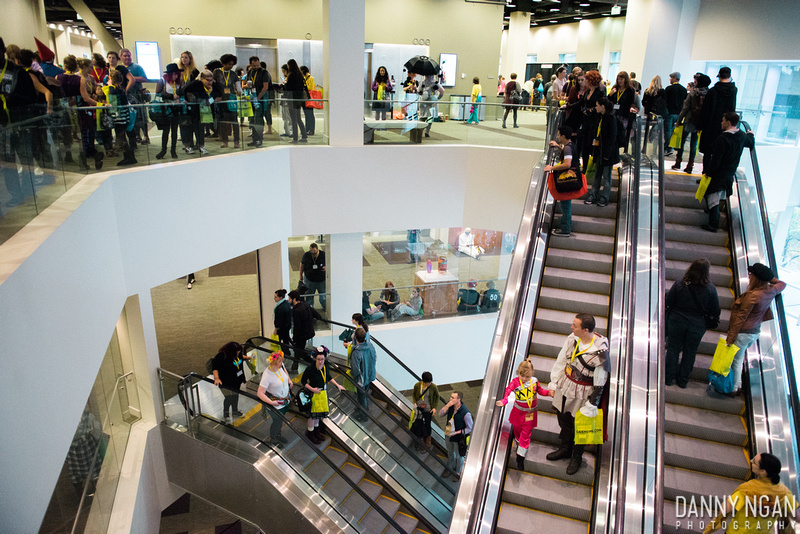 GeekGirlCon ‘13 is a science-lover’s dream and a great place to bring your kids—buy your passes now before prices go up on August 25!